How does a guy with a Hispanic last name end up in Massachusetts and then grow up in a non-Christian home and end up of all things teaching Bible prophecy? August Rosado: I just have to say God is amazing. I remember giving my life to the Lord on April 22, 1988, 10:49 AM on a Thursday morning. I remember it like it was yesterday. I came from a non-Christian home. My family was plagued with drugs and alcohol. I come from a family of 14 and there is sadly only six of us left. Drugs and alcohol have killed off the rest of my family. It was on that day April 22, 1988, that somebody shared with me the Good News of the saving power of Jesus, and it just penetrated my heart. My brother had just died a month earlier from a drug deal gone bad, and I remember walking home extremely intoxicated. I'm not proud to say that. I remember looking up into the sky and saying, "God, if you are there, show me that you are there." And, the next day at work, the Lord brought an individual to me who shared with me the Good News. Nathan Jones: "Ask and it will be given to you," right, Luke 11:9? August Rosado: Exactly, Nathan! I remember that day. I just bowed my head and I trusted in Jesus Christ as my Lord and personal Savior. I went back home and I told my girlfriend Patty (we weren't married then), "Patty, something amazing happened to me at work." She replied, "You got a raise." I said, "Well, you could say that, yes, a spiritual raise." She asked, "What are you talking about?" And, I answered, "I trusted in Jesus Christ as my Lord and personal Savior." Instead of being happy, she went ballistic. She went crazy! She wouldn't talk to me. She declared, "I don't want any religious fanatics in this house!" Well, that following evening the guy who led me to the Lord brought the pastor over and he talked with her and then Patty got saved, and my mother got saved, and my twin brother got saved. That's Acts 16:31 at work. Dr. Reagan: Go ahead and tell the story about when the pastor started talking about living with somebody you're not married to. August Rosado: I remember when Patty and I went to a conference in Rhode Island. The preacher was talking about fornication. Now, I had never heard of fornication before. I thought it was some kind of skin disease! I had never heard of it. Since my pastor was sitting next to me I asked, "Pastor, what is fornication?" He said, "Well, August, that is two people living together without a marriage license." I turned back to Patty and relayed, "Patty, fornication is two people living together without a marriage license. Hey, he is talking about us!" So, I added, "We need to get married." Two weeks later we got married because we wanted to make things right and the Lord just began to work in our lives. Dr. Reagan: Up to that point you didn't even know anything about the Bible, did you? August Rosado: Nothing about the Bible. Dr. Reagan: Okay, so what did you do? Did you start intently studying the Bible? August Rosado: Actually, my pastor took me to a Jewish Synagogue on Shabbat, the Sabbath. I had no idea why he was taking me to a synagogue. I remember asking, "Pastor, why are we going to a Jewish synagogue?" He replied, "August, the Jews are God's chosen people. They are the apple of His eye. Did you know that Jesus Christ was a Jew?" Well, I thought He was just a Gentile who was a Christian God, and I had no idea that He was Jewish. What a blessing to have a pastor like that, because he had such a burden for the Jewish people. So, he takes me to the synagogue and I remember putting on this little beanie on my head — a yarmulke — and was wondering why they were wearing these long colorful robes which I later found out are called a tallit or prayer shawl. I remember sitting there and the pastor is telling me, "These are God's choose people. The Jews are the fulfillment of Bible prophecy, and the Church has never replaced the Jews." Right there the Holy Spirit began to quicken inside of me and I just had to learn more about this. I went to my very first Bible prophecy conference when they were all over the place in New England. Today, unfortunately, there are hardly any Bible prophecy conferences. Back in 1988 there were prophecy conferences everywhere, but now they are few and far between. I remember the first term the speaker used was "Rapture." He first explained the Rapture and as he was later talking about the Second Coming of Jesus our blessed hope at the end of the Tribulation period, I felt the Holy Spirit working in me and calling me to teach this very subject. And, as you know, the rest is history. The Lord has just been so good to us. That is my passion — preaching and teaching Bible prophecy. Dr. Reagan: For awhile you were a pastor of a church, weren't you? August Rosado: I was for five years. During that time I continued to study and received formal training with the Friends of Israel Gospel Ministry. Dr. Renald Showers was my teacher. He's a wonderful teacher and it was a great program that they have for teaching people the Bible and the importance of a Jewish heritage. Dr. Reagan: You got some really good founding. From there, when did you decide to move into the full-time teaching of Bible prophecy? August Rosado: It was I would say after I was done pastoring. I pastored the Blessed Hope Bible Fellowship for five years and then I really felt the call of God to go out across the country and teach and educate people about Bible prophecy. Dr. Reagan: Wasn't that sort of frightening to just resign your job and step out in faith? August Rosado: It was, it was. But, little is much when God is in it. When the Lord calls you to do something, you just go and do it. Dr. Reagan: Okay, so you began to go and hold meetings on Bible prophecy and during that time you met somebody and you were invited to speak in Corpus Christi, right? August Rosado: That is correct. We were in Kansas at the time and I was preaching an eight day Bible prophecy conference. The gentleman who was broadcasting the conference live said he was going to Corpus Christi and wanted to know if I wanted to go. I answered, "Well, I don't know anybody down there. Let me tell you what, let me go down there, talk with the pastor, and then I will give you a call back." So, finally, he calls me back and told me that the pastor wanted me to come down. We then drove from Kansas all the way down to Corpus Cristi, Texas ("God's Country") and when I got down there the pastor just started bombarding me with questions on Bible prophecy. He asked, "Brother Rosado, would you preach for us Sunday morning on the Rapture?" And I said, "I would love to!" I made it down to People's Baptist Church in Corpus Cristi and preached that Sunday morning behind the pulpit. That is a church which is affiliated with the Rolloff Ministries. The Rolloff Ministries were founded by Brother Lester Rolloff some 53 years ago with the purpose of helping men and women around the country struggling with drugs and alcohol and things of that sort. He took people from all over the country looking for help. Brother Rolloff went home to be with the Lord in 1982 due to a terrible plane crash. When we got down to the church, I discovered Rolloff Ministries was looking actually for someone to represent the homes. I told the pastor at first, "Pastor, I just want to let you know that my passion is Bible Prophecy and I really don't want to change that." He replied, "Brother Rosado, we don't want you changing anything. You go out there and you teach and preach on Bible prophecy, and then of course also just let them know about the Rolloff Homes." That never changed. They called me to work with them and that just opened up all kinds of doors with the churches all over the nation affiliated with their ministry to preach at. I could go in and make a presentation about the Rolloff Ministries and then teach them Bible prophecy as well. Nathan Jones: That is a wonderful synthesis of where you came from and where you are now. We can see the Lord working through your life to merge all those experiences together into how you now serve Him. August Rosado: It is only a God thing, Nathan. I'm still mind boggled today as to what God is doing. I remember it was about eight years ago and I was sitting in my living room and the ministry was just going nowhere. I prayed, "Lord, I simply just don't understand why it isn't going anywhere, but I'm just going to trust you." Then, all of sudden, look at what God has done! I just want to give Him the glory for that. Nathan Jones: So, almost every weekend you are out on the road preaching in churches across the nation? 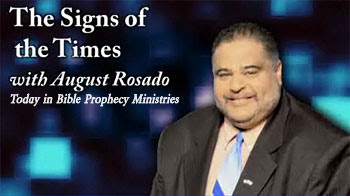 August Rosado: I can always be found on the road preaching in some church. Dr. Reagan: August, you are a living example of one of my favorite scriptures in the whole Word of God, and that is in 2 Chronicles 16:9, "The eyes of the Lord move to and fro throughout the earth that He may strongly support those whose heart is completely His." August Rosado: That is an awesome verse! Dr. Reagan: To think that God is just looking around trying to find people who have really given their heart to Him so that He can support them and encourage them. And, boy, I tell you, when we look at your history we can see God's hand was upon you and He has moved you to a place where He has magnified your voice and used you to warn people of the soon return of Jesus. August Rosado: I just give Him all the glory for it. It is my passionate message that Jesus Christ is indeed coming soon, and it could be today. In the next part of our interview with August Rosado, we'll ask him to share his burden for the Jewish people. 1. A pro gay marriage, pro abortion, Kennedy worshiping bunch of far left liberals elect a Republican to the "Kennedy" Senate seat. 2. A guy with a Hispanic last name ends up in Massachusetts and then grow up in a non-Christian home and end up of all things teaching Bible prophecy. Which would you have bet the farm would NEVER happen? Hopefully what will also never happen is the media darling and Mormon Mitt Romney becoming our next president (see our show on him). This is an encouraging testimony for all of us that are considering to serve the Lord full time. May the Lord greatly bless Brother Rosado's Ministry.